Pancakes and sausage mingle together to make your new favorite breakfast (or dinner), Sausage Pancakes. Sausage is dolloped with pancake batter and cooked to make this all-in-one meal that is sure to be a family pleaser. Are you guys breakfast for dinner kind of people? I have to admit, the majority of the time that pancakes are made in my house it’s at dinnertime. My kids will always eat pancakes so they are an easy dinner to reach for when we’re short on time and I don’t feel like negotiating. We probably do some variety of pancake about once a month for dinner. Whether you eat them for breakfast or dinner, I’m pretty sure you’re going to love these Sausage Pancakes. These pancakes are an all-in-one meal with a sausage patty in the middle of the pancake for the ultimate in sweet and savory. When I told the kids about the idea they flipped and we went to the store the next day to get the necessary ingredients. You know dinner is going to be successful with that kind of reaction. First, I started by whipping up my very favorite pancake batter, buttermilk pancakes. They are so light and fluffy guys. While the batter sat for the required 10 minutes, I cooked the sausage patties on the griddle and then wiped it almost completely clean with a paper towel. Leaving behind a liiiitle bit of the sausage grease behind keeps the batter from sticking and ups the sausage flavor. I used regular ‘ole breakfast sausage patties but you could mix it up by using maple or sage even. You do you. Heat a griddle to medium heat. While it's warming up, mix up the pancake batter. In a large bowl, combine the flour, sugar, salt, baking powder and baking soda. In another bowl whisk together the buttermilk, sour cream, eggs and butter. Pour the liquid into the dry ingredients and mix until just combined. Set aside for 10 minutes to allow batter to thicken. Cook the sausage patties on the griddle until no longer pink. Remove from the griddle and wipe it down with a paper towel. Leave a little grease behind for flavor. Place 4 to 6 sausage patties on the griddle (depending on the size of your griddle) about 4 inches apart. Ladle 1/3 cup of batter over each sausage patty and spread, if needed, so that the batter goes over the sides of the sausage. Watch for bubbles on the edges then flip. Cook until second side is golden. Repeat process until the sausage and batter is gone. 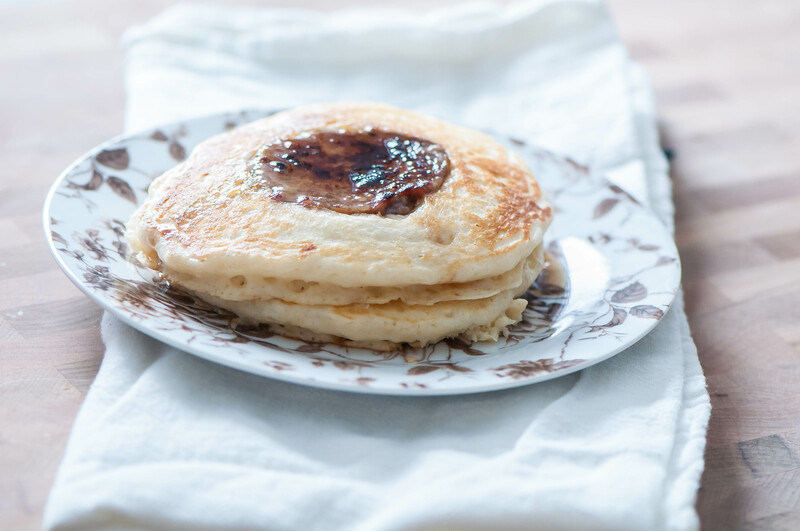 Drizzle with maple syrup and enjoy. What a combination! I love that the sausage is IN the pancake! Brilliant! Thanks so much Erin! They are so fun and delicious.